After a month of snow we are seeing a rise in mercury level today. Though I don't believe that 2012 is the end of the world, the erratic weather had me wondering for a while. Global warming has been the hot topic for ages, and now the world is worried about the cold spells. I have no clue, whether it is kaliyuga, or the El Nino, one of the scientific reasons, what do you think? Whatever comes in 2012 or whatever happens tomorrow, we need to deal with the present, right? So far no controversies on that bit, I hope. Since food is an essential and we are on a food blog, let’s get back to the obvious. Ever since Oraphan announced her giveaway, I have been thinking of sharing this recipe, but got delayed with the holiday season and the recipes thereof. This Cauliflower-Bellpepper masala is an easy dish. I make this as a side dish for chappathi, whenever I am not in a mood to saute onions, or in a time crunch. 1.Cut the cauliflower and broccoli into bite sized equal pieces. 2.Heat oil in a wide pan and add crushed garlic and saute for 2-3 minutes. 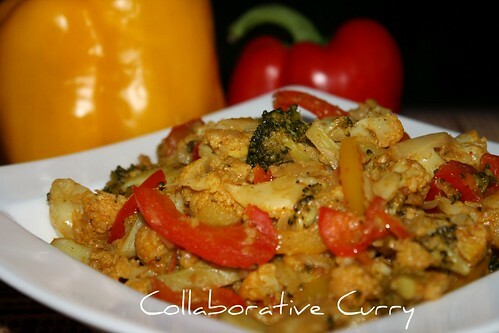 4.Throw in the cauliflower and broccoli pieces and mix well to coat with masala. 5.Pour 2-3 Tbsp of water, cover and cook till the veggies are 3/4 done on medium low heat..
8.Add this to the cauliflower masala,mix and cover to cook for almost 4-5 minutes or till the veggies are done. Do not overcook ,as it will make it mushy. 9.Switch off the heat and add the chat masala and mix well. 10.Serve warm with roti or naan after garnishing with coriander leaves. 1.Cooking the bell pepper and tomato is optional and so is cooking in butter. 2.This is a dry preparation, so try to use minimal water. I always like easy recipes..easy and yummy preparation. What a flavorful dish! It looks excellent. Lovely colours and looks yummy dear. Oh Wow! Your Easy Veggie dish looks absolutely amazing! It sounds simple that I can't wait to give it a try. I also LOVE all these beautiful photos. What a fantastic presentation! Sorry I've already used Random.org to pick the winners yesterday but I'll add your name in the recipes drawing prices which I haven't done it yet. Thanks so much and wishing you the best of luck! That just looks wonderful and colorful,Gulmohar! Looks pretty healthy n nice!! !I will surely try this out!!! I like healthy and delicious dish like this...and I need to eat more healthy food. Lovely recipe and easy to make I often make this.Lovely click. looks awesome pass me the plate I have a chapatti!!! I like the addition of bell peppers..will try it. Very colorful curry...seems so healthy n perfect with roti. Very colorful..I can already visualize it... would be awesome with chappathi!! nothing to add, it's simply delicious!!! This sure is a very colorful curry. Well If it is snowing in Southern India I would probably believe the word gonna end soon. The color is just gorgeous- After all if u live in East coast Gosh U need to bare the worst cold weather! What a wonderful dish. I love curry with cauliflower in it. I can't wait to try it. Our weather is warming up today and should be back to seasonal temps (70s F) in no time. We aren't used to such long cold snaps here in Florida! oh this sounds great with the peppers! I love the colors! Lovely recipe dear!! Wonderful pics too.. n I agree with u evrybody was talking abt global warming n suddenly temperatures have dropped to lowest in decade!! @Nostalgia:(referring to the comment on my blog) you're right, it's about 25g, I omitted it because,in italy, we use yeast in pack of 25g.If you want a very good pizza use only 15g and let rise for up to 4-5 hours. This is a lovely colorful curry. looks delicious and such a wonderfully easy and flavorful dish! That is a colourful and flavoursome dish!!! That was a nice dish. I prepare it the same way but I dont use barcolli and chat masala. Very flavorful veggie curry Nami! Droolworthy masala veggies, looks prefect with rotis.. Wish you and your family a very happy and prosperous new year. I appreciate for your wonderful presentation with mouth watering pictures. Veg curry looks delicious and yummy. Here in France, we're having a normal winter (as it is meant to be, with snow & low temperature) this year and experts say that it didn't snow this much since the 1960's...last year, we had a wonderful hot summer and a normal spring.....everything seems to be normal, maybe it's kinda re-cycling after a period of years.... so, global warming????????? they look good, crunchy and well flavoured(nice idea frying the bell pepers& tomatoes separately)must have tasted great with the chappatis!!! have a nice day!! Delicious and colorful dish....amazing clicks. 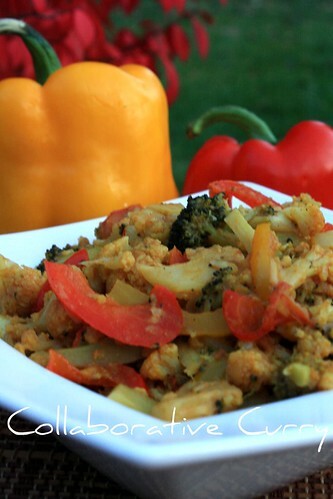 The veggie masala sounds delicious, I like the combo of bell peppers and cauliflower! Oraphan : You are so sweet :-)Thanks a lot !! Lovely color and looks yummy dear..